There are some classy Barbados restaurants... Champers Restaurant and Wine Bar is one such restaurant. 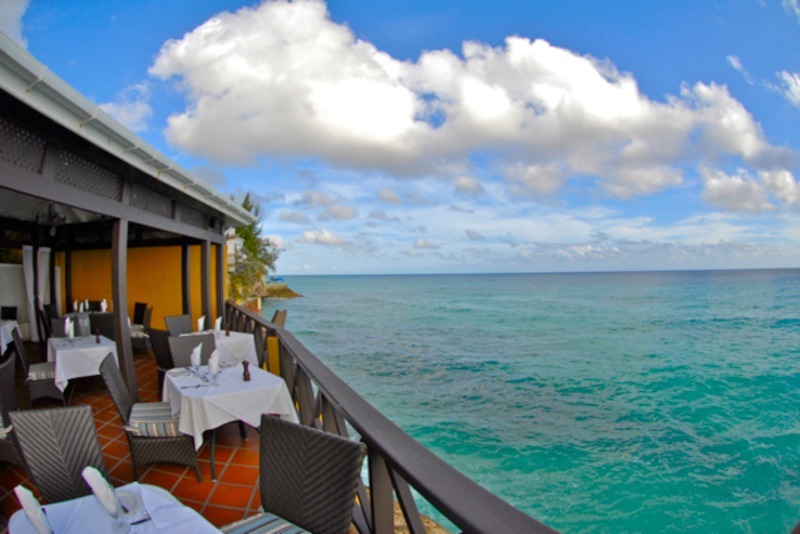 It is located on a cliff overlooking the gorgeous Accra beach on Barbados active south coast. Champers has develop into one of the south coast leading restaurants offering a high value casual dinning experience in relaxed yet classy atmosphere. Its elevated location offers patrons a magnificent panoramic view over the beautiful south coast waters... But this is not all to the Champers experience. The romantic atmosphere and setting is complimented by the vibrant Caribbean design of the traditional Barbadian building that house the restaurant. I first went to lunch at Champers back in 2001 when my boss and I took some clients to lunch. The restaurant was highly recommended as the ideal place for a business lunch. At that time the restaurant was located north of its present location on Hastings beach.. Since that first introduction the restaurant has move to a much nicer location overlooking Accra beach. This new restaurant has a classy dining area, which offers two choices for dinners. The downstairs area is romantic and features a waterside dining Gazebo with lounge and bar. Upstairs you’ll find enhance elegance in a spacious dinning room also with its own lounge and bar...But the deccor is just one small part of this first-class dining experience. One look at the menu suggests that this Barbados restaurant is the place to have lunch or dinner. All the items listed sounded mouth-watering... there was Spiced Deep Fried Calamari with Ginger and Teriyaki sauce, Scottish Smoked Salmon, Shrimp and Mango Salad and Coconut Shrimp and Chilli sauce. Sound exotic and delicious? Well this was just the starter as you glance further down, the main course sounded even more tempting. Porch Salmon Salad & Caper Dressing, Cajun Blacken Dolphin with Savory Rice, Grilled Barracuda lemon & Caper Butter plus Potato Mash and Grill Salmon with Whole Grain Mustard Sauce & Savory Rice to name a few. I know with so many mouth-watering items on one menu… you’re wondering how do you decide what to choose... Well I know the feeling and what a task! Well for starters the soup of the day is always nice... but if you want to get a little adventurous Coconut Shrimp and Chilli Sauce would also be a good pick. And for your main course I would recommend the Cajun Blackened Dolphin with Savory Rice. It’s delicious! So if you are looking for Barbados restaurant that offers good food and value for money then Champers Restaurant and Wine Bar is the perfect place for lunch or dinner.